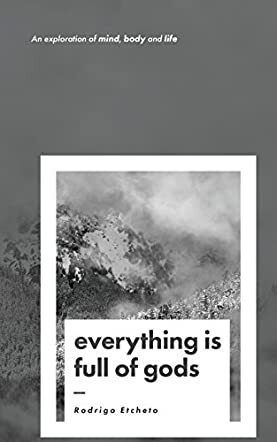 Everything is Full of Gods by Rodrigo Etcheto is a book of reflections and thoughts with philosophical and religious underpinnings. Inspired by Thales's view that “everything is full of gods,” the author started on a philosophical journey that resulted in the thoughts and reflections in this book. From the first page he explains that just after his graduation from college and having a good job, he consistently questioned the purpose of his life. It was the void he felt within him that prompted him to start the search for meaning. So, he began studying the ancients and against the backdrop of self-doubt, financial stress, confusion, medical crisis, eviction, and bankruptcy, he looked for answers and this book offers his discoveries to readers. Rodrigo Etcheto demonstrates compelling evidence of the existence of God, and it all boils down to one fact — that something exists at all. How he explains this is interesting. He then articulates on deeper topics like existence, the power of emotion, the ideal of life, the relationship between mind and body, and between thought and action. In the heart of this book is the powerful recommendation that spiritual exercises can help us live more refined, disciplined, ordered, and happy lives. The author introduces a wide selection of philosophical thoughts, including relevant ideas from schools of thought like the Stoics and the Epicureans, and philosophers like Eddington, Whitehead, and Spinoza. This book could be an excellent introduction to philosophy, a book with powerful spiritual themes and insights and a strong appeal to fans of New Age spirituality. The author's thoughts are featured alongside beautiful and breathtaking photographs depicting different features of nature. It’s an inspirational and insightful book, with concepts that will help readers reflect on life and their purpose.